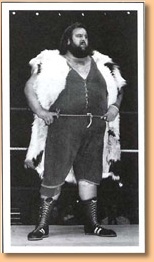 "The History of British Wrestling," originally published in Pro Wrestling Press. The article is reprinted here at The House of Deception by kind permission of author John Lister and the [then] editor of PWP, Greg Kelly. 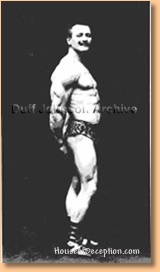 We have added matching photos from our archive. 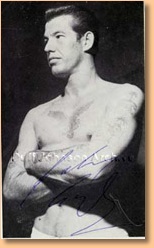 The sport first caught on through a Cornish-American ex-miner named Jack Carkeek who would move from theatre to theatre challenging audience members to last 10 minutes with him. 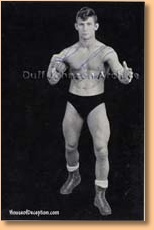 His bluff was called one night in London's Alhambra theatre (now Leicester Square Odeon) [see images below], when the Russian George Hackenschmidt, fresh off a major tournament win in Paris' Folies-Bergere Palace, answered the challenge. 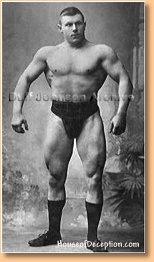 Knowing of Hackenschmidt's reputation as Europe's leading Greco-Roman grappler, Carkeek quickly came up with the excuse that his challenge applied to Englishmen only. One of the famed 'insider' stories of the time came when Jack Pye met Bert Assirati in what was billed as a supreme grudge match. 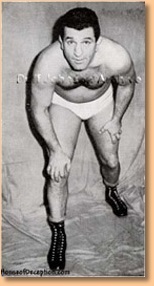 The pair had agreed to draw the match one fall apiece, but immediately after getting his opening fall, Pye loudly complained the referee was biased and walked out of the match, leaving Assirati the technical winner, but Pye the victor in the crowd's eyes. 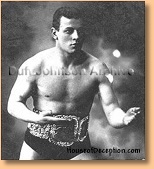 Attempts to relaunch the business in 1947 failed to catch on, with a major show at London's Harringey Arena featuring Ireland's Jack Doyle knocking out the Estonian 'Butch' leaving journalists condemning the gimmickry and as good as calling the show a fake. The financial advantages of this arrangement helped the members survive the tough conditions caused by a post-war tax that took 25% of all entertainment revenue. Other promoters were not so successful. 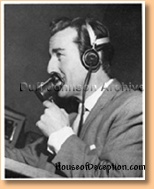 The closure of Haringey Arena in 1954 was the last straw for Atholl Oakley, and Joint Promotions were the only major player left to benefit when Chancellor Peter Thorneycroft abolished the entertainment tax in the 1957 budget. 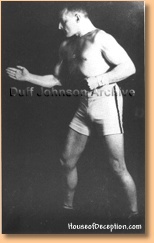 At this point the only independent promoter of any real note was Paul Lincoln, who survived on a shoestring budget, working his own main events as the masked 'Dr Death'. 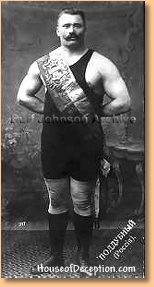 The Joint stranglehold also spelt bad news for Bert Assirati, whose hardman reputation had him marked down as a troublemaker. 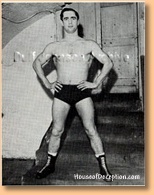 He held the group's heavyweight title in 1955 but quit without dropping the belt the following year. 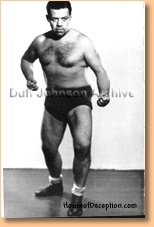 Such was his confidence, he even showed up in the audience in a December 1957 show at the Royal Albert Hall and issued a grandstand challenge to the visiting Lou Thesz; Dale Martin promoters and security staff made sure Assirati never had the chance to test his reputation. Television was a money-maker itself for Joint Promotions, with rumours of a £15,000 weekly fee going in their pockets, while the wrestlers featured in a broadcast would be lucky to get £200 between them. But the exposure of wrestling on television proved the ultimate boost to the live event business - it became part of mainstream culture. Indeed a 22 May 1963 show at the Royal Albert Hall featured Prince Philip as a guest of honour. By the mid 1960s, Joint had doubled their live event schedule to somewhere in the region of 4,000 to 5,000 shows a year. Every town of note had a show at least once a month, and at some points more than 30 cities had a weekly date. For live events per square mile, Mexico City and perhaps Tokyo are perhaps the only areas to rival this spell of business, and it is doubtful that any territory worldwide has ever seen so many shows putting gate receipts in the pockets of so few promoters. The true story is that the pair fought in two televised matches ending in draws, to set up the 1963 Cup Final Day match, which McManus won by stoppage. There is no hard evidence that the bout drew much more than around five million viewers. On Cup Final Day in 1965, both men appeared on TV but in separate matches. They had a famous rematch at the Royal Albert Hall in 1967, again ending with a stoppage victory for McManus. 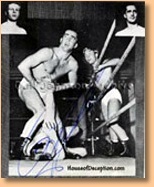 In any case, Pallo slipping out of the ring and kissing McManus' wife at ringside in the 1963 match was considered major heat at the time, and the feud was so successful that the pair are by far the two best remembered performers of the era. The fact that both men are still around to tell the tale, and do so regularly, perhaps contributes to their enduring legend. It was at this point that Jarvis Astair (an entrepreneur who had tasted success by pioneering closed circuit coverage of major boxing shows, and as part of the Wembley group would go on to play a key role in bringing the 1992 SummerSlam event to the UK) bought out Dale Martin promotions. He replaced the managing director Johnny Dale with brother Billy, perhaps believing Billy would be more likely to follow orders. Astair went on to buy out the remaining promotions involved in Joint, along with Paul Lincoln's independent group. One might have thought the new finances would be used to spark another boom for Joint Promotions, but it was not to be. With so many of the old guard of wrestling out of the business, Astair was forced to rely on people from outside the industry. Eventually he sold out to the bookmakers William Hill, leaving the wrestling industry run by a public company with little experience of this unique business. But this was hardly the only concern for Joint Promotions. In 1985, regular Big Daddy partner Tony 'Banger' Walsh told all to The Sun about the true nature of wrestling. This was not a first: a 1972 News of the World expose saw a locker room bugged to record two wrestlers discussing a finish. 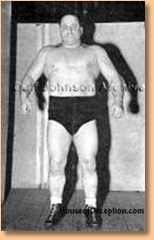 A 1981 court case with wrestler Masambula suing promoters after suffering an injury on a defective ring revealed that he suffered the injury one round before his scheduled defeat. And a frustrated Pallo went into intricate detail in his 1983 expose 'You Grunt, I'll Groan'. But revealing these secrets never truly hurt the business; suspension of disbelief was all too easy for the die-hard fans. 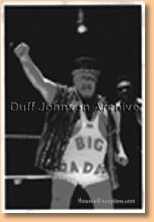 What really hurt was the suggestion that Big Daddy's warm-hearted child-loving image was in fact a sham. The irony is that, as much as attempts to regain former glories may have fallen short, there have likely never been so many promoters working in British wrestling as there are in the early 21st century. All Star Promotions operates a simple policy of emphasising low costs rather than high revenues, combining a few regular venues with a couple of hundred touring dates each year with a curious mix of former American stars, British veterans, fresh faces and the ubiquitous 'UK Undertaker' and 'Big Red Machine'. Perhaps the most profitable promoters are the likes of Orig Williams (an independent promoter since 1973) and Shane Stevens, whose 'WWF Tribute' shows can draw crowds in the thousands, only bringing closer the inevitable trademark infringement cases. Long-time promoters such as John Freemantle (running Premier Promotions since 1987), Scott Conway (whose Wrestling Alliance groups dates back to 1989) and Ricky Knight (who formed WAW in 1993) continue with steady crowds in the low hundreds and the occasional success such as WAW's crowd of 2000 for its Fightmare show. 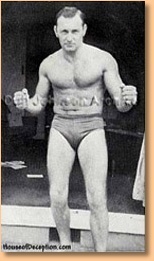 And there is almost an alphabet soup of 'new school' promotions based around training schools, the most prominent being the Frontier Wrestling Alliance, which provided much of the talent for the nationally televised Revival show. 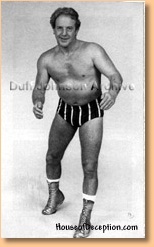 But for all the lessons wrestling history teaches us, the most important is that each boom was a product of its times. The world of 2002 is a vastly different place of that of 1982, let alone 1962. In this era of multi-channel broadcasting and home entertainment, even national television exposure gives no guarantee of a place in mainstream culture. 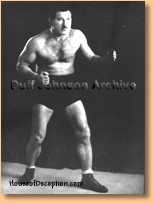 The wrestling business in the United States no longer exists in Britain in the pages of magazines; the WWF is by far the dominant player in this country's wrestling industry. Computers can give a promoter of any size national exposure from the comfort of their bedroom, but the effectiveness of such publicity is still in question. And the biggest change of all is that for a generation of young fans, British wrestling as it was is now neither an idealised reminiscence nor an unshakeable stigma; for today's target audience, British wrestling is starting from nothing.